The TOPS BonusPlus® is your key to savings at TOPS. The TOPS BonusPlus® program offers many conveniences and savings opportunities to its members. No matter when you shop, you'll always save money at TOPS. From our Extra Rewards programs to our thousands of BONUS BUY Savings every week, it pays to shop at TOPS! How Do I Get a TOPS BonusPlus®? 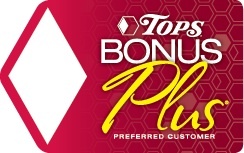 If you are not currently a TOPS BonusPlus® member, applications are available at the Customer Service Center at your local TOPS or you may download an application here. When you sign up for the TOPS BonusPlus® program, you'll get one wallet card and two key tags. Just attach the key tag to your key chain and use it the same way as a card. When you receive your BonusPlus®, you can begin using it and enjoying the savings immediately. Share your cards with your whole family so they can save, too! Each member of your family is eligible to receive their own TOPS BonusPlus®. The cards will automatically be linked together by your household address for savings purposes. For instance, when we are running an EXTRA REWARDS Points Promotion, the more points you earn on the same account, the more savings you'll receive. As a TOPS BonusPlus® Member, you can take advantage of many different types of savings and discounts such as BONUS BUYS, Pre-Priced Discounts, Double Coupons (see store for details) Buy One Get One Free (BOGO) offers, and Cut Out the Clip eCoupons. In addition to these benefits, you can always count on our Everyday Low Prices throughout the store. Now you can load these paperless coupons directly to your TOPS BonusPlus® account with the simple click of your mouse. The savings will be automatically deducted at the register when you check out using your TOPS BonusPlus® account. At TOPS, we double the value of manufacturers' paper coupons every day when you use your TOPS BonusPlus®. See your local store for details. We also run Buy One, Get One FREE sales; your TOPS BonusPlus® entitles you to all you can fit in your cart! Thanks to the TOPS BonusPlus® Program, getting these discounts is easy! All you have to do is watch the savings add up. The TOPS BonusPlus® program offers savings on all items purchased in-store, excluding items prohibited by law and those purchased from franchised departments. Click to find the latest coupon offers and savings deals, all in one place! Here are the answers to the most frequently asked questions about the TOPS BonusPlus®. Q: How do I get a card? A: Please visit any Tops Markets Customer Service desk to fill out an application and receive your card immediately. To save time, download the application. Click Here! A: Simply present your TOPS BonusPlus® or key tag to the cashier who will scan your card or key tag at the beginning of the order to receive discounts and rewards. Your TOPS BonusPlus® can be used in conjunction with all types of payment: ATM debit card, credit card, food stamps, or WIC (where available). TOPS BonusPlus® does not provide a sufficient form of identification for check cashing purposes (driver's license required). Q: Can other members of my household use my TOPS BonusPlus®? A: When you sign up for the TOPS BonusPlus® program, you'll get a card and two key tags. You may choose to distribute these extra cards to family members: however, the cards will remain registered to you. Another option is to have the other members of your household obtain a registered card of their own and have your card and theirs linked together. To have your cards linked, simply call Consumer Affairs at 1-800-522-2522, Monday - Friday, 8:30 am to 7 pm and Saturday & Sunday, 10 am to 4 pm. This becomes especially important during our Extra Rewards points programs because all points accumulated will be linked to one TOPS BonusPlus®. Remember to attach the key tag to your key chain and use it in the same way as your card. Q: How can I find out the status of my TOPS BonusPlus® account? A: You can call our TOPS BonusPlus® Customer Service hotline, available Monday - Friday, 8:30 am to 7 pm and Saturday & Sunday, 10 am to 4 pm, at 1-800-522-2522. Our automated Hotline can provide you with information on store locations, TOPS BonusPlus® program information, current promotional offers, and Extra Rewards Points status. When an Extra Rewards program is in progress, you can check your point totals online. *Please note that you may only accumulate Extra Rewards Points during designated programs which are available for limited times. Q: What should I do if I move, change my name, or if my card is lost, stolen or damaged? A: If your card is lost or stolen, or if you have a name change, please obtain a new TOPS BonusPlus® from any TOPS Markets Customer Service desk. Once you have obtained your new card, please call Consumer Affairs if you need any points transferred. If you moved you can either call Consumer Affairs, or if you prefer, you can fill out an Information Change Request Form at the Customer Service desk in any of our stores. Q: Will you share the information gathered on my TOPS BonusPlus® application? A: TOPS believes in protecting the confidentiality of customer information in accordance with our customers' wishes and applicable laws. Load these paperless coupons directly to your TOPS BonusPlus® account with the simple click of your mouse. The savings will be automatically deducted at the register when you check out using your TOPS BonusPlus® account.